How often do you look for breakfast recipe inspiration? Look no further than this healthy no-bake Greek Yogurt Tart. It makes a nutritious breakfast that kids will love!! It appeals to your sweet tooth, but is healthy and delicious…maybe you shouldn’t tell your kids this Gluten Free Fruit Tart is good for them! Your whole family is going to love this easy no-bake fruit tart recipe. All you need is creamy Oikos Traditional Greek Yogurt, in your favorite flavor, and only 4 ingredients for the homemade tart shell. Fresh fruit is optional, but it definitely makes these fruit tarts even better. I don’t know about you, but our mornings are always so busy. I love that you can spend 10 minutes meal prepping this easy fruit tart recipe, and wake up to a ready-made healthy breakfast! How cool is that? Your kids can even make this simple tart recipe! I love that you don’t have to bake the gluten free tart crust…making this an easy no-bake breakfast recipe. Oikos Greek Yogurt has only 150 calories per cup and 11 grams of protein, making this Greek yogurt dessert healthy. I feel good letting my kids have this breakfast tart because my kids think they are getting a treat. This easy gluten free breakfast tart is very easy to make! Can this fruit tart be frozen? Yes! If you love frozen yogurt…then you will love how good this tart is frozen. Whisk the almond flour, shredded coconut in a bowl. Add in the coconut oil and agave nectar (or maple syrup) and mix well. Press the crust into a tart pan. TIP: You want to use tart pans where the bottom pushes up to release the tart from the pan easily. Use your fingers to really press the crust tight so it will hold together better. 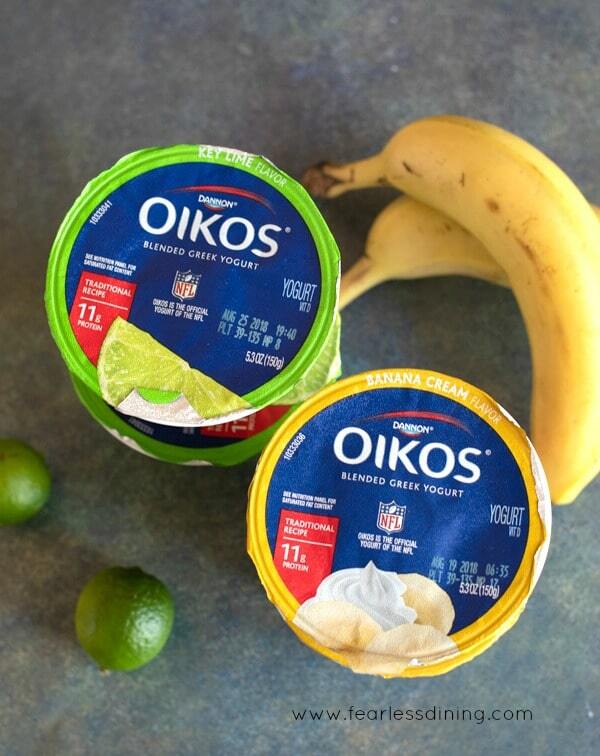 Add in your favorite flavor of Oikos Greek Yogurt! We used Banana Cream and Key Lime, but there are so many other delicious flavors to choose from! My daughter couldn’t wait to dig into this gluten free fruit tart. Key lime flavor Greek yogurt is by far her favorite flavor! 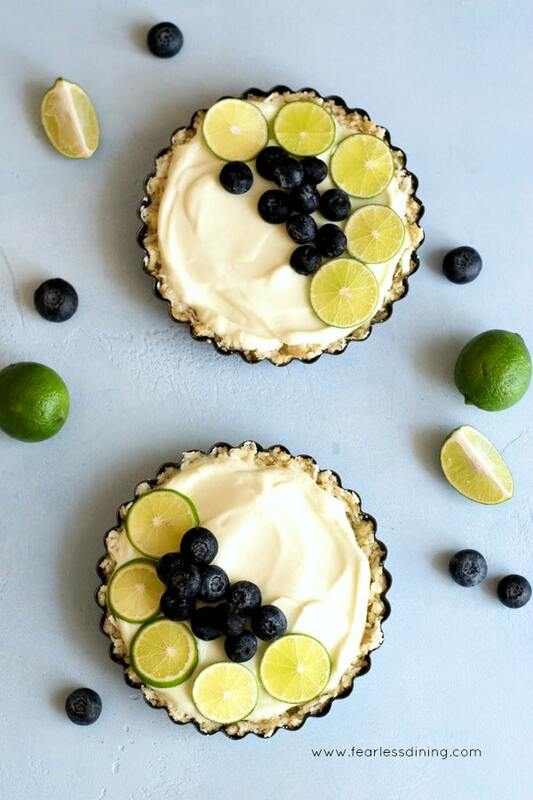 Healthy gluten free no-bake Greek yogurt fruit tarts with a simple 4 ingredient crust. In a bowl, add every ingredient except the yogurt. Mix the crust ingredients well. Divide the crust into four round tart pans. Press the crust down to fill into the tart pan ridges. Pour your favorite flavor of yogurt into the tart pan and smooth the top. Top the tart with your favorite fruit. (optional) Chill 20 minutes, or even freeze if you prefer a frozen treat. This is such a great recipe for summer with it being no bake and perfect for topping with fresh berries. The flavor combinations in this are brilliant. What a tasty healthy treat? I love that it is gluten free. I can’t wait to make this. Thank you so much Katie, it is a fabulous breakfast, or dessert. I completely agree with you, greek yogurt is a life saver. I use it in both desserts and dips as well – Yum! I like the idea of using yogurt as a dip too! YUM! These tarts look so delicious and so easy to make! Perfect for summer parties! What a perfect little dessert for the summertime, and also so beautiful you made like little pieces of edible art. Need to make them before summer ends.